Despite its huge array of differing landscapes - from jungles and mountainous plains to temple towns and thriving cities - Thailand is mainly known as the gateway to some of the world's best-known sun-drenched island getaways, especially for a winter sun escape. Landing in Thailand's frenetic capital city of Bangkok (the country's primary airport), it's likely you will head further south towards the infamous network of islands after a day or two of city exploring if you're looking to indulge in a beach holiday. But if you are short on time, exactly how many of the islands can you see without feeling exhausted and in need of another holiday? For the more adventurous traveller who doesn't mind roughing it on Thailand's great infrastructure of trains, buses and ferries, a two-week island hop can cover a vast amount of ground - a challenge I set myself back in July. Although you could spend a week or more in Bangkok exploring the splendid temples, local neighbourhoods, shopping districts and crazy nightlife, it's best to decide from the outset how much time you want to spend in the city, since this will cut into your island time. I recommend at least two days to see the highlights, including visiting the Grand Palace, Wat Po and the shopping malls in Sukhumvit, and cruising the Chao Phraya River, eating your way through Chinatown and chilling out in the backpacker haven of Khao San Road. There's an option to grab a late train after your second day in Thailand, or alternatively you can leave on a morning train from Bangkok to Chumphon, where you can then catch the ferry across to Koh Tao. Train and ferry combo tickets are available to purchase from local travel agents in town or via your guesthouse/hotel. Alternatively, purchase the train ticket in advance and your ferry ticket on arrival. Koh Tao is the perfect mix of beautiful stretches of beach, stunning snorkelling and diving areas, and enough ground to explore on foot or by moto, alongside fresh seafood restaurants with a perfect sunset view and a great atmosphere at night without being too raucous. You may well be tempted to stay longer, especially if you want to learn how to dive: Koh Tao is one of the most popular spots in the world to do so. With only a one hour long ferry ride to think about, my friends and I timed our arrival to Koh Phangan in the early afternoon with the date of a Half Moon party, which we attended that same evening, giving us time to explore the area beforehand. While many only come here on a day trip from Koh Tao and Koh Samui to attend the Full Moon or Half Moon parties, Koh Phangan does have some glorious beach spots away from Haad Rin Beach. A daytrip to the north of the island will bring you to more isolated beaches and scenic treks. If you are keen to explore the Andaman coast or the western islands of Thailand, the mainland town of Krabi is a good place to head to. Not only is it a funky area to explore, but it's also the ferry and boat hub to the many surrounding islands. From any of the ferry networks leaving Koh Tao, Phangan or Koh Samui, head to the eastern mainland port of Suratthani having purchased a ferry and bus ticket combo. From here, the bus will be waiting for you to take you across the Thai mainland to the other side. Catch an early morning boat from Krabi to the stunning Railay Beach further along the mainland - a small, compact and stunning stretch of land that feels like an island in itself. Practise rock climbing on the incredible limestone cliffs, explore the caves, be daring enough to climb the treacherous hike to the lagoon crater, and relax on the two incredibly beautiful beaches. Boats leave Railay daily, so be sure to catch the morning ferry to Koh Phi Phi, one of Thailand's most loved islands. Although slightly overrun now that it has soared in popularity thanks to the movie The Beach (filmed on the stunning Maya Bay), the surrounding smaller islands and the luscious blue-green hues of the lagoons are an absolute must-see, accessible on one of the many day trips you can book from the operators all around town. Although a young party island at night, it's a hilly island that's great to explore on foot, where you will find small treks and climbs that bring you to incredible viewing points across the peninsula. I ended my island hopping in Phuket as it's a cost-effective flight route back to Bangkok. To see a different side to Phuket, we stopped overnight in Phuket Town where the ferry docks - a local area rich in Chinese history, architecture and arty finds. It was also a welcome break to a further bus trip to the beach areas on the same day, as sometimes the ferry journey is enough to zap your energy stores. 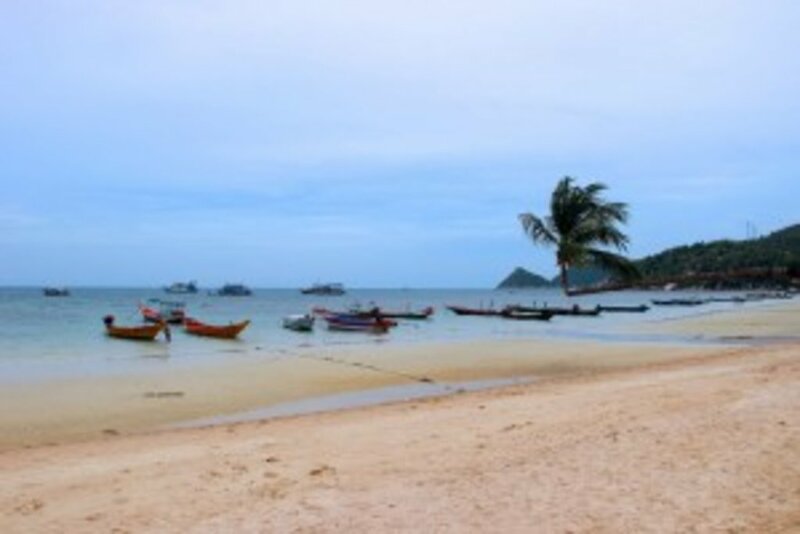 Phuket is package holiday hell, and while the popular beach resorts of Patong, Kata and Karon are great for a quick beach fix, the island does have some beauty spots. Think about embarking on a day trip or two to the James Bond Island or the nearby remote island getaways of Koh Rocha or Koh Hae for a last minute feel of paradise. For those wanting to save even more time, there are airports in the mainland towns of Hua Hin, Chumphon and Krabi, as well as on the islands of Koh Samui and Phuket, although this will add a fair bit to your budget since the ferry ticket combos are only in the region of around £10 one way while the flights are a little more expensive. Alternatively, pick either the Andaman Coast and explore Phuket, Phi Phi and also Lanta and Lipe, or stick to the east coast and add a more luxurious break in Koh Samui to the list. If you are keen to spend more time in Bangkok and want a quick-fix island getaway to boot, think about visiting the nearby islands of Koh Chang and Koh Samet as a more accessible combination.